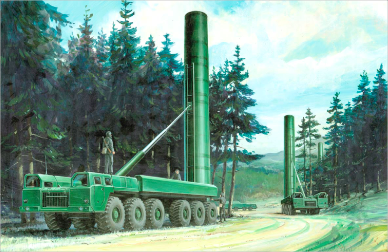 The Soviet Union deployed hundreds of mobile, SS-20 intermediate force missile launchers in the 1980s—with three nuclear warheads on each missile and reloads for each launcher. The illustration is from Soviet Military Power 1985, a publication of the US Defense Intelligence Agency. Every year on New Year’s Day, we mark the occasion by uploading all remaining articles from the issues published during the preceding calendar year. See the archive page here for more than 2600 individual articles from March 1985 to October 2018. You can watch our video chats—8:00pm Eastern Canada time every Monday—on our Facebook page, or watch all our recent shows right here. (On the screen below, click the small icon on the upper left to see a full list of videos). You can submit comments on selected articles during the current issue’s date-span (eg Apr-Jun 2019). We are using a slightly different article template for these articles; follow the links in the paragraphs above, or see this issue’s table of contents page to pass your judgment on current articles. Comments are moderated, so will not display immediately on the page. If you want to discuss an earlier article with us, or if you would like to submit a letter to the editor for publication, you can write the editor directly. We have an archive of past and current Peace Crosswords on this site. Puzzles open in the free Litsoft program, which is an attractive and easy to use interface for solving puzzles. The puzzle homepage includes download links for the software: you can access it here. If you’re a subscriber and prefer solving the puzzle on paper, you may want to use the software program to check your answers—no need for waiting until the next issue arrives in the mail! Facebook page: www.facebook.com/pages/Peace-Magazine. Another way to keep connected and give us your feedback on our articles. We can take most online payments through PayPal. See the right-hand sidebar on this page for special forms for new subscriptions and renewals; other payments, such as gift subscriptions, can also be paid online by request (we’ll email you an electronic invoice). You are, of course, always welcome to pay with Canadian or US cheques through the mail. 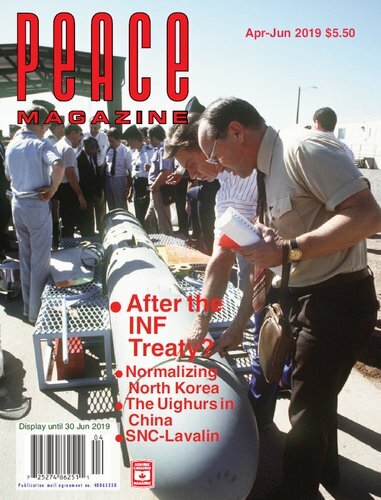 Our cover gallery can be found at www.peacemagazine.org/covers.htm. Below each cover thumbnail is a link to the article index for that issue.